John Damilakis is full professor and chairman at the Department of Medical Physics, Faculty of Medicine, University of Crete, chairman of the Division of Radiology at the University of Crete and director of the Department of Medical Physics of the University Hospital of Heraklion, Crete, Greece. He is chairman of the International Organization for Medical Physics (IOMP) Education and Training committee and member of the Board of Directors of IMPCB (International Medical Physics Certification Board). Prof. Damilakis is coordinator or an active research member of several European and national projects. Most recent projects: EUCLID (European strudy on clinical DRLsfor X-ray Medical Imaging), EC project, Scientific Coordinator, Chair of the Executive Board, WP1, WP3 and WP5 leader, kick-off meeting September 2017 and MEDIRAD (Implications of MEDIcal Low Dose RAdiation Exposure), Horizon 2020, WP2 leader kick-off meeting June 2017. His publications have been focused on medical dosimetry and medical radiation protection. Number of publications in PubMed: 192, number of citations 3489, h-index 31. Many of these publications are in leading journals such as Medical Physics, Physics in Medicine and Biology, Radiology, Investigative Radiology and European Radiology. John Damilakis is editor of 1 book and co-author of 2 chapters in international textbooks. He is a member of the steering committee of the ‘Inter-University Postgraduate Course in “Medical - Radiation Physics’, Greece (1998-today). He has given more than 300 invited presentations in national and international conferences including ECR, RSNA, AAPM, IOMP and EFOMP meetings. John Damilakis is past president of the Hellenic Association of Medical Physicists, Senior Editor of BJR/Case Reports, Section Editor of the European Radiology and editorial board member of several scientific journals. He has received several awards in recognition of his work in the field of Medical Physics. Jaroslav Ptáček works as the head of the Department of Medical Physics and Radiation Protection in the University Hospital in Olomouc, Czech Republic. He is a medical physicist in nuclear medicine and focuses himself mainly on image processing, quality control and radiation protection. He is involved in teaching of medical physics and instrumentation in nuclear medicine and x-ray diagnostics in technologists education program. He is also involved in education and training of medical physicists in nuclear medicine in Czech Republic who are working on becoming qualified medical physicist. As a board member of Czech Association of Medical Physicists he is involved in professional matters of medical physicists in Czech Republic. Since 2013 he is a part of local organizing committee of ESMPE in Prague and since 2018 he is a secretary general of EFOMP. I am currently the head of Medical Physics providing scientific management in medical physics with responsibilities for service delivery, capital finance management and service development. I lead a group of 2 clinical scientists, 19 technologists, 2 nursing assistants, 1 equipment librarian and 1 admin staff, providing Nuclear Medicine and medical equipment management services for NHS Ayrshire & Arran. I am responsible for the procurement and management of major capital equipment to a value of £2.7 million every year. Our team manages over 8000 pieces of medical equipment with a value of £42 million. Head of Radiation Protection at Medical Exposure Section since June 2014, Assoc. Prof. since January 2016. 12.2013 – 03.2016 Hospital for Women's Health "Nadezhda" Part time Medical Physicist Responsible for controlling quality control program, for advising the hospital management and clinical staff on all aspects of radiation protection of patients and staff, for determination of typical doses received by patients during X-ray imaging procedures. ▫ Protocol nº SPI-ZEV-11-301; A phase III, open-label, multicenter, randomized study of sequential sequential Zevalin (ibritumomab tiuxetan) versus observation in patients at least 60 years of age with newly diagnosed diffuse large B-cell lymphoma in PET-negative complete remission after R-CHOP or R-CHOP-therapy. ▫ Protocol nº AAA-III-01; A multi-center, stratified, open, randomized, comparator-controlled, parallel-group phase III study comparing treatment with 177Lu-DOTA0-Tyr3-Octreotate to Octreotide LAR in patients with inoperable, progressive, somatostatin receptor positive, midgut carcinoid tumours. ▫ Protocol nº 307940 (EC); A phase III, open-label, prospective, two-armed, multicenter, randomized, group sequential study to evaluate the efficacy and safety of subsequent treatment with the Zevalin (ibritumomab tiuxetan) study regimen versus observation in patients with diffuse large B-cell lymphoma who are in complete remission after first line CHOP-rituximab (CHOP-R) therapy. ▫ ZEVALIN NHL FIT Study – Protocol nº 304820 (EC); Efficacy and safety of subsequent treatment with 90Yibritumomab tiuxetan versus no further treatment in patients with stage III or IV follicular non-Hodgkin`s lymphoma having achieved parcial or complete remission after first line chemotherapy. A prospective, randomized phase III clinical trial. ▫ SMART Study; Multicentre Randomised Survival Study of Monoclonal Antibody Radioimmuno-Therapy: A multinational study in patients with ovarian carcinoma using the HMFG1 antibody labelled with Yttrium-90. ▪ “Regional Traning Course on Radiation Protection in Diagnostic and Interventional Radiology”. International Atomic Energy Agency (IAEA). Chisinau, Republic of Moldova. 11-15 June, 2001. Prof. Dr. Kay-Uwe Kasch (born in 1966) was educated in Dresden, Heidelberg and Vancouver, BC. His interest in Medical Physics started early with getting his first graduation from the German Cancer Reseach Center (DKFZ) Heidelberg in 1992. After doing research in particle therapy at DKFZ and TRIUMF Vancouver, Canada he graduated with a Ph.D. in 1996 at the Ruprecht-Karls-University Heidelberg, Germany. Being a research scholar at the Charité, University Medicine Berlin for more than 6 years he moved to Jeddah, Saudi-Arabia in 2002 to work as a Senior Medical Physics Consultant at the King AbdulAziz University. Being appointed as a Professor for Medical Radiation Physics at the Beuth University of Applied Sciences, Berlin he returned to Germany in 2006. There he is currently Dean of the Department of Mathematics, Physics and Chemistry. He served and serves a member of various professional organizations. As Board Member and Chair of Communication and Publication of the European Federation of Organizations for Medical Physics (EFOMP) he was actively involved in getting Medical Physics up on the agenda within the European and international frameworks. At the moment he is the German representative to EFOMP Council and (co-)chairs various organizations on national level. He is teaching various courses within the Bachelor and Master Curricula of the Applied Physics – Medical Engineering study, mainly with a focus on radiation physics, radiation therapy and nuclear medicine.His research interests are radiation therapy, particularly novel approaches in particle therapy and Tomotherapy. Born in 1957 in Łodź, Poland. Graduated from Warsaw University, Faculty of Physics, specialized in medical physics in 1981. From 1980 till 1997 medical physicists at Medical Physics Department, Cancer Center-Institute of Oncology in Warsaw. From 1997 till 2010 head of Medical Physics Department in Holycross Cancer Center in Kielce. From 2010 back at Cancer Center-Institute of Oncology in Warsaw. From 2012 head of the Department. In 1997 PhD at the Faculty of Physics at Warsaw University. From 2007 Associate Professor. President of Polish Society of Medical Physics (2012 – 2014 and from 2014 till now). From 2006 specialist in medical physics according to the Polish law (expert in medical physics). Lecturer at the Jan Kochanowski University in Kielce (2009 – 2011), at Warsaw University (2012 – 2017), at European School of Medical Physics, Archamps (2012 – 2014), and also at the ICTP in Trieste. Author of more than 30 articles published in peer-reviewed journals. The co-author of several Polish recommendations in radiotherapy. Father of 4 children and grandfather of 8 grandchildren. Marathon runner. − Head of the Medical Physics Dpt of the Udine University Hospital, from 1986 to 2014 and Deputy Director of the Imaging Dpt. from 204 to 2014. − Clinical medical physicist at the Medical Physics Dpt of Udine Hospital, from 1977 to 1986. − Expert of IAEA in several missions in developing countries in Europe, Africa, Asia and South America. − Chair of the Physics Committee of the ECR for the 2014 and Board member of the Physics Committee of ECR from 2011 to 2013. 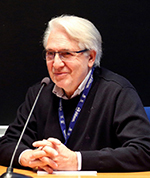 − Head of the Medical Physics Section of the Italian Society of Radiology from 1998 to 2000. Dimitris Visvikis is a Director of research with the National Institute of Health and Medical Research (INSERM) in France. He is co-director of the Medical Image Processing Lab in Brest (LaTIM), where he has been leading a group on quantitative multi-modality imaging for therapy applications. Finally, he currently has an appointment as a consultant physicist within the Brest University Hospital, while he has held different principal and consultant MPE positions in the field of Nuclear Imaging in the UK over the last twenty years. Within this context he has previously led the development of PET and PET/CT clinical units and associated research at the University of Cambridge and University College London, following his PhD in PET hardware development, working within the Institute of Cancer Research and the Royal Marsden Hospital in London. He has spent the majority of his scientific activity in the field of PET and SPECT imaging, including developments in both hardware and software domains. He is a member of numerous professional societies such as IPEM (Fellow, past Vice-President International), IEEE (Senior Member), AAPM, SNM (CaIC board of directors 2007-2012), EANM (physics committee, 2017-), EFOMP (Examinations board, Projects committee). He is currently the most recent past chair of the IEEE NPSS Nuclear Medical Imaging Sciences Committee (chair: 2013- 2015), he was MIC program chair for the 2016 NSS/MIC conference in Strasbourg and he is the current Editor-in-Chief of the new NPSS journal “IEEE Transactions in Radiation and Plasma Medical Sciences”.